The studio is in a loft area on the 3rd floor of this old warehouse. The entrance is through a glass door marked here with a red arrow in the photo. 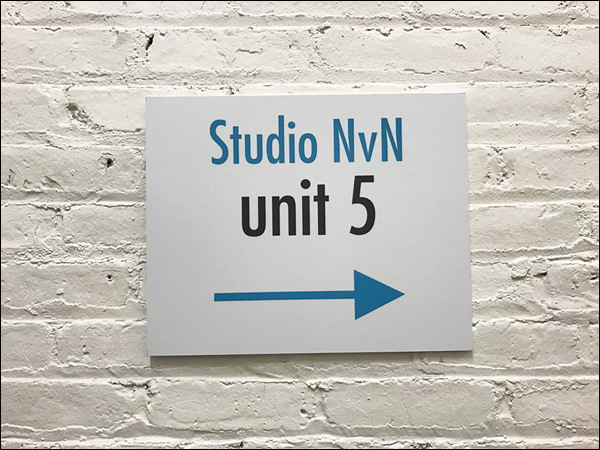 Look for the sign that says ‘Studio NvN’. Access is via stairs, but there is also a freight elevator if you need. Call me or text me if you need to bring up gear via the freight elevator. 1.) If you’re outside a graphic designer, or the carpet store, (or a Quick Check), then you’re on the other side of the building. Just come down Main Street, to the other corner to where you see Kelly’s Custom Guitars and Clarion Furniture. 2.) If you’re at 103 Main Rd, and you see a PNC bank, you’re about 3 or 4 blocks away still. Just continue on to 101 East Main Street, until you see this warehouse in the photo.